August 28th — we receive the news that we will be heading for Nouméa, New Caledonia for a few days. This is not really great news as Nouméa is more akin to an Army Camp and has very few available young ladies. So the most you can look forward to is a few cold beers or maybe a dish of ice cream, if you so desire. However, this visit is to be a very special occasion. 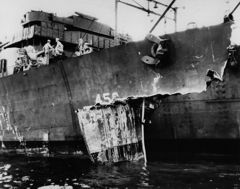 Battle damage to O’Bannon sustained in ramming Chevalier at the Battle of Vella Lavella, 7 October 1943. The Free French people of Nouméa, are going all out to hold a dance for our destroyer squadron. It has been nine months since we have had a chance to see or touch anything as fragile as a young lady. All stops have been pulled to make it a great evening. Someone has been able to find nine young French girls to attend the dance. And they are all quite attractive, or at least they seem so to me. Of course, the number of chaperones in attendance insures the young ladies will leave the dance as nice as when they arrived. Everyone seems to greatly appreciate a fine evening. We continue this duty with little let up through September . . . September slipped into October. As the days went on the officers and crew of the O’Bannon began to accept the sounds of their ship daily preparing for battle as commonplace, just as a man who works in a noisy office comes to accept its sounds as part of his daily environment. The fear that death might be their shipmate any night, the drudging ordeal, the confinement, the tension, the oppressive feeling from watching scurrying barges loaded down with men and deserted by their navy being blasted to flaming death, all assumed the proportions of a horrible normality. The men were listless. Officers and crew alike had lost much weight. Captain MacDonald found his clothes hung on his body like a badly fitted suit . . . To talk in more than monosyllables was an effort. Meals in the wardroom would open with a bustle of conversation, only to die away in complete silence before they finished. Acute sense of time and space was benumbed. The only thing that was real was the ship, the commands, the sun scorching like a branding iron—and the sea, always motionless and reflecting the white-hot glare. Death, heretofore a taboo subject, was openly discussed. We are told that we are winning the war; we hope we never have to find out what it is like to be on the losing side. October 4th — we return to Vella Lavella with two other destroyers to intercept and destroy two barges and one gunboat. October 5th — we return again to Vella Lavella but make no contacts, we make a sweep around the island before returning to base. October 6th — we return to Vella Lavella but this night Japanese planes spot us and drop flares but, oddly enough, no bombs. A Japanese force of nine destroyers and twenty barges is trying to rescue 600-some soldiers who are stranded on Vella Lavella. Our force consists of three destroyers with the remaining three destroyers of our force some distance away. Japanese planes drop dazzling lights, which slowly float down held suspended by small parachutes. These lights outline our force of three destroyers. We close on the Japanese destroyer force and firing commences on both sides. Flames flare up from two of the Japanese ships as they are hit by our shells. But within seconds one of their torpedoes rips into the Chevalier. The entire ship separated as if a giant knife had sliced her in two. The stern turned about and swung into the path of the O’Bannon as if steered by a phantom quartermaster. The command “Hard right rudder” and then “Back emergency” was not good enough and it was evident the ships would collide. The order was given: “stand by for a ram . . . stand by for a ram,” and every officer on the bridge grabbed the small brass rail running around the pilothouse. Crew members lunged for metal supports, gun mounts. In the fireroom men who might be trapped in an inferno of scalding steam dropped their tools and held onto railings and ladders, their faces tight with apprehension. In the handling room and magazine, men threw themselves on the deck, eyeing the stacks of shells and tins of powder. The O’Bannon, unable to avoid hitting the Chevalier, crashes into her after engine room. Our luck holds however as we hit a glancing blow and bounce clear. Our bow is ripped back more than twenty-five feet and water pours in. In the emergency radio room, another radioman and I happen to belong to that two percent who never get the word and the impact throws us a short distance but we are unhurt. The crash knocks out all power on the ship and even the emergency battle lights at our location fail to light. Fortunately the sound powered phone works fine and we are back in communication with all stations on the circuit. While we sit in total darkness we are informed that our ship may be sinking as water is pouring into the forward compartments. And at this time more Japanese planes arrive. Luckily for us, the phrase “Have a nice day” has not yet been invented. Three Jap bombers zoomed down and released a stick of bombs. They exploded with a roar off the O’Bannon’s stern and sent sheets of water high in the air. More bombs are dropped, followed by showers of flares. Against the backdrop of harsh white light the Chevalier settled rapidly. Boats were being lowered off the O’Bannon and the screech of protesting davits could be heard plainly. Less than 6,000 yards ahead a Jap destroyer was still burning. Now alone, the destroyer Selfridge continues to fire at the Japanese destroyers and scores a hit but in return receives a torpedo that blows up the forward area of the ship engulfing it in flames. All three ships in our force are now dead in the water and without power. Within minutes however, our damage control crew has the emergency generating system in operation and power is restored to the O’Bannon. With the restoration of power comes word there are emergency messages to be sent back to our base. While hurrying to the bridge to pick up these messages, I have a chance to look out across the water. What I see is rather amazing. There are many small lights out in the water, maybe a hundred of them. They turn out to be flashlights being held and waved by sailors from the Chevalier who are jumping from the rapidly sinking ship and are swimming toward the O’Bannon, a distance of about 40 yards. It seems that everyone in the water has a flashlight and is waving it to get attention (later information indicated that some type of fish that emitted light was in the surrounding water in record numbers, probably stirred up by the torpedo explosion). Messages coming in from the Chevalier stress that they are sinking rapidly and need assistance. Our whale boats are already heading out to pick up survivors. After sending the radio messages, a quick acknowledgment is received from our base radio station at Guadalcanal. They will be providing air cover at daylight. It is comforting to know that everyone is now aware of our present predicament. Word from our damage control parties indicate that they have been able to shore up the damage to our bow and we are no longer in danger of sinking. Word is received from the other destroyers of our force that they are just over the horizon and have been watching the gun flashes of the battle and will be coming to our assistance shortly. More good news and bad news. The good news is that remaining ships of the Japanese task force are not attacking. The bad news is the 600 Japanese troops have been safely evacuated and will be around to fight another day. But the Japanese are not looking for further adventures this night. They make a hasty exit except for one of their destroyers that is on fire and slowly sinking. With 85 percent of the Chevalier’s crew accounted for and no more that can be located on board, the O’Bannon heads for home at one-third speed, leaving behind the ship’s whaleboats for any survivors that may have been missed. The whaleboats were found the following day and were full of survivors, 78 in all. However, all were Japanese. American PT boats took the Japanese to Vella Lavella as prisoners. The badly damaged Selfridge finally gets underway at three knots as the Chevalier sinks beneath the waves. Every bit of available deck space on our ship is taken by the Chevalier survivors. Her dead are stacked respectfully on the fantail of our ship and are covered with tarpaulins. For the crews of the O’Bannon, the Selfridge and the Chevalier, the battle of Guadalcanal is finally over. For those under tarpaulins, the war is finally over. But, dead or alive, we are all heading home.